The Witness Aid Services Unit provides a variety of court-related services, social services, and counseling services designed to meet the needs of crime victims, witnesses, and their families. The unit also provides information related to the prosecution of the case, assists victims in understanding the criminal justice system, and provides information regarding crime victims’ rights. The unit assists victims in overcoming the emotional trauma resulting from victimization and provides advocacy and support throughout the criminal justice process. The unit also works collaboratively with assistant district attorneys to assist victims. The unit has a staff of 31 and is comprised of four departments. Spanish speaking staff is available in each of the departments. Interpreters for other languages, including American Sign Language, are also available. All services offered by the unit are free of charge. For the convenience of victims, the Witness Aid Services Unit provides services in the New York County District Attorney’s downtown and Northern Manhattan offices (Counseling and Social Services Departments only). The Witness Aid Services Unit can be reached at 212-335-9040. The Social Services Department conducts interviews with victims, witnesses, and their families to assess their social, emotional, and financial needs. Based on this assessment, the social services staff provides direct services as well as advocacy and referral information. Compensation assistance through the New York State Office of Victim Services. The Social Services Department is located in both the District Attorney’s downtown and Northern Manhattan Offices. To learn more about these and other services, call the Social Services Department at 212-335-9040 Monday through Friday, 9 a.m. to 6 p.m. The Victim Assistance Center is a secure, comfortable, supportive environment where victims, witnesses, and their families are introduced to the extensive services available to them through the District Attorney’s Office. Victims also receive information about their rights in the criminal justice system and are afforded an opportunity to provide information important to the prosecution of the case. Explain the criminal justice system and orient victims to their role in the prosecutorial process. Serve as a liaison between victims and Assistant District Attorneys, the Police Department, the court system, and other criminal justice agencies. Provide victims with case information and answer questions regarding the court process. Provide information about an inmate’s custody status and help victims to register for notification of an inmate’s release from a correctional facility. Advocate for obtaining a court order of protection. Arrange transportation to court for victims and witnesses who are elderly, disabled, or injured; a wheelchair is also available. Prepare absence excusal letters for employers and schools. The Victim Assistance Center is located at 100 Centre Street, Room 231. The Center is open Monday through Friday from 8:30 a.m. to 6:30 p.m. The staff can be reached at 212-335-9040. The Counseling Department helps victims, witnesses, and their families deal with the emotional impact of victimization. Victims may experience symptoms such as anxiety, depression, flashbacks, and difficulty sleeping, eating, and concentrating. The Counseling Department also assists victims in dealing with difficulties associated with their participation in the legal process. The Counseling Department is staffed by New York State licensed social workers. 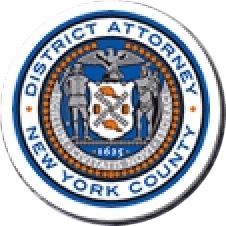 The Counseling Department is located in both the District Attorney’s downtown and Northern Manhattan Offices. Counselors are available Monday through Friday, 9 a.m. to 5 p.m. Evening hours are available upon request. For more information or to make an appointment, call the Counseling Department at 212-335-9633. The Notification Department offers a variety of court-related assistance to victims that eliminate unnecessary court appearances and provide victims with important case-related information. For more information about the services provided by the Notification Department, call (212) 335-9374, Monday through Friday, 8:30 a.m. to 8 p.m.